For Melvin I. Urofsky ’61, ’68 GSAS, Louis D. Brandeis is like the man who came to dinner — and never left. Urofsky, a historian, has devoted decades to the legal lion of Louisville who ascended to the U.S. Supreme Court under Woodrow Wilson and, after serving on the high bench for 23 years, left an enduring mark on jurisprudence and political thought. The culmination of a lifetime of scholarship was Urofsky’s definitive biography, published by Pantheon Books in 2009 to critical acclaim. 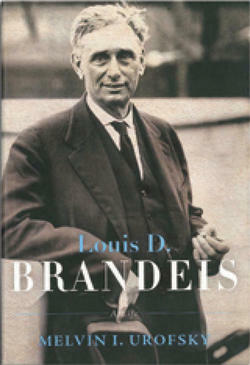 Louis D. Brandeis: A Life, a doorstopper at 953 pages, came on the heels of seven volumes of Brandeis correspondence that Urofsky collected, co-edited and published with David Levy, a history professor at the University of Oklahoma. How long did it take Urofsky to write the Brandeis biography? “It took 45 years,” he says, laughing. To serious students of the Supreme Court, Urofsky’s work is no joke. Melvin I. Urofsky ’61 says his definitive biography of former Supreme Court Justice Louis D. Brandeis is the product of 45 years of work. PHOTO: JEFF WATTS, COURTESY OF AMERICAN UNIVERSITYAll told, the Urofsky oeuvre encompasses 52 books he either wrote or edited. His American Zionism from Herzl to the Holocaust, published in 1975, won the Jewish Book Council’s Morris J. Kaplun Award in 1976, and his Brandeis biography won the University of Louisville Louis D. Brandeis School of Law’s 2010 Brandeis Medal. Urofsky appears in a 2007 documentary, Justice Louis D. Brandeis: The People’s Attorney, produced to mark the sesquicentennial of the justice’s birth, and he has lectured at venues around the world for the State Department. Not bad for a kid from Liberty, N.Y., a small town in the Catskills where, Urofsky remembers, he literally knew everyone he encountered on a stroll down Main Street. His family roots, however, were on the Lower East Side. Urofsky’s grandfather, a barber, “summered” in the Catskills, cutting the hair of resort-goers, then moved the family to Liberty and opened his own shop. Urofsky’s father was a bookkeeper, killed in a WWII training incident in Texas; his mother was a telephone operator. Urofsky was valedictorian of his high school class of 75, in a school that had 12 grades in one building. A local Columbia alumnus, Dr. Harry Golembe ’17, ’19 P&S, encouraged him to apply, and a full tuition scholarship sealed the deal. He lived in Livingston (now Wallach) Hall, entering as an engineering student but switching to history after higher level calculus and chemistry courses confounded him. Peter B. Kenen ’54, the great economist, was Urofsky’s adviser, and Bernard W. Wishey ’48, ’58 GSAS, Henry Steele Commager and Walter P. Metzger ’46 GSAS were among his teachers. “This was a history department of stars in those years,” Urofsky recalls. It was in Metzger’s 20th-century American history class that “a light bulb went off — I could do that,” Urofsky says. So he went to GSAS, with the notion that he, too, could teach. He earned a Ph.D. in 1968 in history. Urofsky “fell in love” with an American history course covering 1877–1920 that was taught by William Leuchtenburg. This led to a doctoral thesis proposal on Brandeis’ role in shaping Wilson’s progressive platform for a “New Freedom.” But after spending “a very happy day” immersed in the Brandeis papers in Louisville, Urofsky concluded the documents did not justify a thesis, which then became his 1969 book, Big Steel and the Wilson Administration: A Study in Business-Government Relations. Five books of edited and annotated letters were completed by 1978 and two more were published in the 1990s, after the two Brandeis scholars obtained access to the papers of Supreme Court Justice Felix Frankfurter and the letters Brandeis wrote to his family. After graduating from law school in 1983, Urofsky began teaching constitutional law almost exclusively and became an adjunct at several law schools. Currently, he teaches at American in Washington, D.C., and also an occasional course or seminar at VCU. 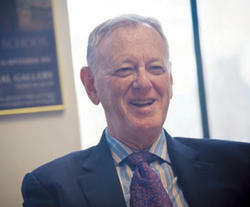 Eugene L. Meyer ’64 is a former longtime Washington Post staff writer and editor of B’nai B’rith Magazine. He has freelanced for several publications, including The New York Times and U.S. News & World Report.